On March 18th, three young women and eleven young men at thirteen different universities raced to long tables, their white coats billowing behind them, and snatched up white envelopes. With shaking hands, they tore open their envelopes to find the same name printed on the paper inside: Emory University Department of Radiology and Imaging Services. March 18th was National Match Day, the day graduating medical students in the U.S. and Canada found out where they would complete residency training. Less dramatic but equally exciting was the email notification residency directors like Dr. Ho simultaneously received identifying their new residents. 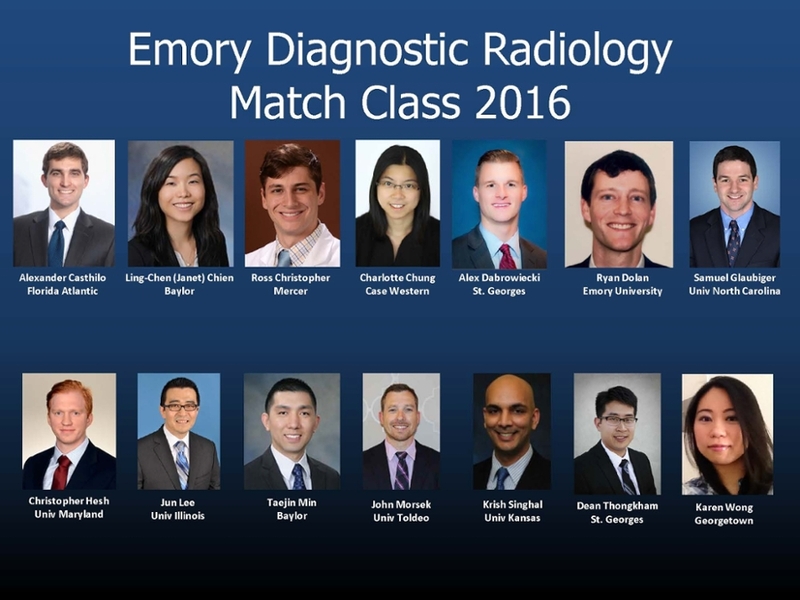 “We’re pleased to welcome our newest class of residents to Emory and to the department,” said Christopher Ho, MD, director of the Diagnostic Radiology Residency Program and assistant professor of radiology and imaging science based in the Breast Imaging division of Emory University School of Medicine. The National Resident Matching Program® (NRMP®) is a private, non-profit organization established in 1952 at the behest of medical students to provide a fair, organized mechanism for matching the preferences of more than 40,000 applicants with the preferences of residency program directors looking to fill about 30,000 residency positions. Nearly two dozen Radiology faculty plus the three chief residents are involved in the intense three-month process. One group reviews the more than 700 applications and identifies a percentage to interview. The second team conducts interviews. Each candidate spends a whirlwind day at Emory, with an optional informal dinner the night before so candidates can learn from current residents what Emory is like. After a brief morning orientation, four different faculty members conduct successive fifteen-minute interviews with each candidate. Candidates then tour the hospital with a senior resident, conference with an attending physician, and lunch with other residents. The department then sends its final rankings of the candidates to NRMP, which uses its proprietary algorithm to make the final matches. These new residents will arrive at Emory in June 2017 after they complete their required one-year internships.